Propagating the authentication and authorization information for a cloud service consumer across multiple cloud services can be a challenge, especially if multiple cloud services or cloud-based IT resources need to be invoked as part of the same overall runtime activity. The single sign-on (SSO) mechanism enables one cloud service consumer to be authenticated by a security broker, which establishes a security context that is persisted while the cloud service consumer accesses other cloud services or cloud-based IT resources. Otherwise, the service consumer would need to re-authenticate itself with every subsequent request. An advantage to the SSO mechanism is how it enables mutually independent services and IT resources to generate and circulate runtime authentication and authorization credentials. The credentials initially provided by the cloud consumer remain valid for the duration of the user’s session, while its security context information is shared with the other IT resources. 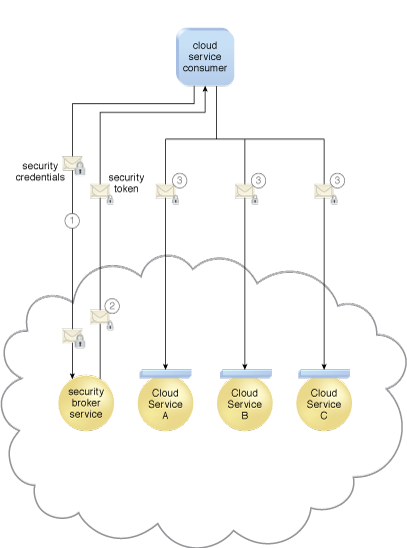 The SSO mechanism’s security broker is especially useful when a cloud consumer needs to access cloud services residing on different clouds (Figure 1). Figure 1 – A cloud service consumer provides the security broker with login credentials (1). The security broker responds with an authentication token (message with small lock symbol) upon successful authentication, which contains cloud service consumer identity information (2) that is used to automatically authenticate the cloud service consumer by Cloud Services A, B, and C (3).